Latest Posts | Girls Get IT! Campers from Girls Get IT! (Innovative Technology) Camp 2013. While programming robots, the girls were having fun! The girls learned Computer Aided Design in Rhino 3D. We decorated safety glasses because you have to look good even when you are being safe. The girls used power tools to create yummy chocolate cake, STEM style. Girls Get IT! teachers for the 2013 camps. Every girl learned how to solder and took home their own creation! The girls really enjoyed programming with Arduino. 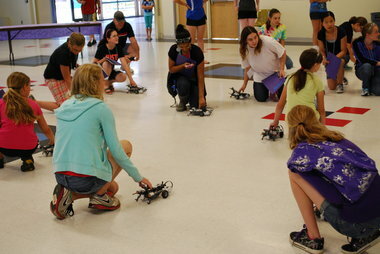 "Programming robots was my favorite part about camp!" The girls tried out Computer Aided Drafting, most for the first time. Girls Get IT! 2015 applications are open! Read more about Girls Get IT! 2015 applications are open! Girls Get IT Camp is in full swing at Hillsboro High School. It is important that girls have a chance to grow their confidence and experience STEM in a positive way. Otherwise less than 15% of the girls would go onto a STEM related career. Every girl said that they would feel more confident in an all girl class learning about STEM, as a result of the week every girl left feeling more confident about themselves and their abilities in STEM. That is amazing.